Interview and readings with Bland Simpson, author of "Two Captains from Carolina." INTRO – One was a commissioned U-S Navy officer and later a hero of the Confederacy. The other born into slavery who bought his way to freedom not once but three times. The lives of those featured in the new book “Two Captains from Carolina” could not have been more different but the book’s author says they had remarkable similarities as well… at least in one realm. George Olsen has more. On the one hand the stories of Moses Grandy and John Maffitt share much in common. Bland Simpson, the author of “Two Captains from Carolina” which weaves the stories of these two men together in one book. “Together” may be too strong a word… at no point in their lives did they ever meet or speak, their only commonality being a shared North Carolina heritage and a life on the water. And in the pre-Civil War period no commonality would likely have been allowed as Maffitt was a white man in the employ of the U-S Navy and Grandy for much of his life a slave in the employ of whoever had bought his services. Those contrasts are reflected in how those two men came to decisions about adopting a sailor’s life. Bland Simpson reads from “Two Captains from Carolina” about the tail end of an adventure aboard the USS Constitution which locked in Maffitt… the son of a well-known pastor though raised by his Uncle, a Cumberland County Doctor… to a life on the sea. That fire fed Grandy enough that he worked hard to purchase his freedom… and not just once but ultimately three times, his first two owners cheating him of his purchase and selling him before his final owner was true to his word. That fire also led Grandy… once ensconced in the Northeast… to purchase the freedom of family members and into the abolitionist cause, a cause that could be seen as a change in his focus. Maffitt likewise saw change in his sailor’s career… prior to the Civil War’s eruption he resigned his Naval commission and offered his services to the confederacy, though perhaps without the fire that led Grandy to abolitionism. Despite his lack of faith in the Confederacy’s leadership, Maffitt ultimately became perhaps its greatest Naval hero, operating as a blockade runner. But the fire of the Confederacy never really burned in him. His one fire throughout his lifetime was stoked by that early adventure on the Constitution and the months and years onboard ship that followed. In lives both markedly similar and dissimilar, those final two words of an imaginary epitaph for Moses Grandy work as well for John Maffitt. 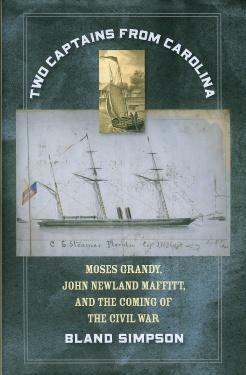 Bland Simpson is the author of “Two Captains from Carolina: Moses Grandy, John Newland Maffitt, and the Coming of the Civil War” published by the University of North Carolina Press. I’m George Olsen.